Welcome To My Working Studio! 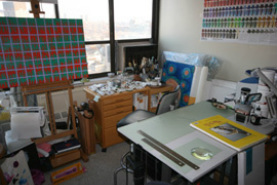 This is my Cambridge Massachusetts studio where all the work happens. I'm often fascinated by artists studios because they always seem so interesting. They have a billion different colors and an array of cool looking tools. I hope you find this interesting and it gives you a window into my creation process. Please feel free to browse through my site and generally poke around. If you do see something you'd like to purchase please allow ample time for printing prints and packaging originals. It can at times take a couple weeks depending on how backed up I am. If I am away I will have this information amply displayed on my site. I use PayPal business for all orders and NEVER see your credit card information. I do not sell any of your contact or shipping information either. When you go to checkout you can choose to use your credit card OR your PayPal account if you have one. YOU DO NOT HAVE TO HAVE A PAYPAL ACCOUNT TO USE THIS SERVICE. All billing is through Art By Lil. You will see this on the receipt you receive by email. Any taxes due will be reflected in the cart.